Jacqueline asked me to produce this beginner’s show. She wanted to know what the furniture in a room is called in German. So let’s start our tour through a virtual apartment. If you enter a typical German apartment, you open the door, die Türe, die Türe, and get into a corridor. It is called Flur. Here you can take your shoes off and put your coat on a hanger. The place to store your shoes and coat is called Garderobe. Garderobe. It is the cloakroom. But now off on our tour! We start with the living-room. It is called Wohnzimmer in German. Wohnzimmer. In the living-room there’s usually a place to sit, for example a couch. We also call it a couch in German. Or sofa. If you sit on a sofa and want to drink something, you put it in front of you on a small table. That table is called Couchtisch. Couch-Tisch. 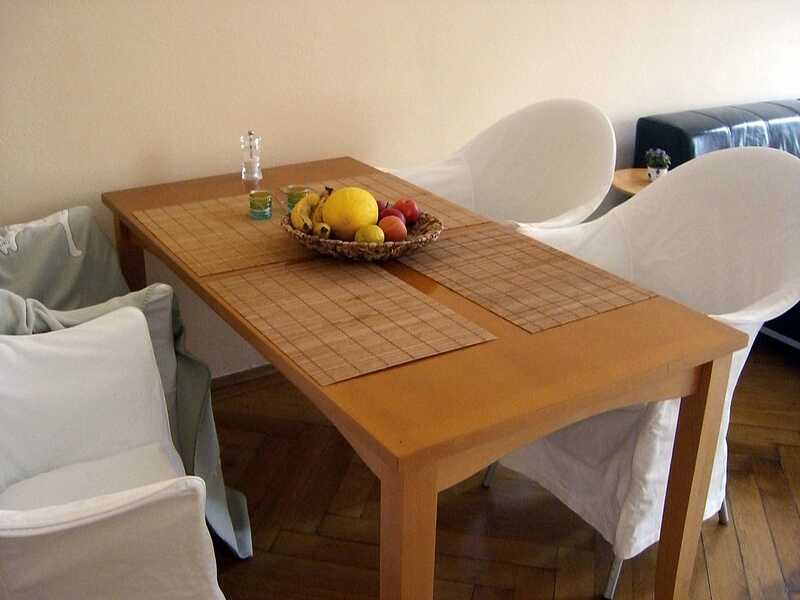 In some living-rooms there’s also a space for dining. But many homes have a separate area that is called Esszimmer. Dining room. Ess-Zimmer. The main piece of furniture here is a table. It is called Tisch in German. Tisch. You sit at a table. And you sit on chairs. Chairs are called Stühle. One chair is a Stuhl. More chairs are Stühle. Stühle. We go through to the bedroom. It is called Schlafzimmer in German. Schlafzimmer. The main thing in a bedroom is the bed, of course. And that one is easy to remember, it is called Bett in German. Bett. Beside the bed there is a small table to put books on. It is called a Nachttisch. Nacht-Tisch. On it there is a lamp. The Nachttischlampe. Nacht-Tisch-Lampe. You put your clothes in a wardrobe, it is called Schrank in German. Schrank. What more is there to tell you? If you want to store your books somewhere, you put them on a shelf. A shelf is a Regal. Regal. I think that’s enough for today. Have fun learning German! Vielen dank fur deine podcast. Ich komme aus Indian und deine podcasten sind sehr interessant. Vielen Dank für den Podcast. Er ist sehr nützlich. Thank you so much for doing these podcasts! I am an absolute beginner and I find your audios very helpful. I have a little request, if you are planning on doing some more of those beginners topics (and I’m definitely following them! :)), could you please include an article (definite or indefinite) whenever you present a new noun in German, like you did with „the door“. It would be very helpful! Thank you very much For this interesting podcast, i have studi ed german at school more than 20 years ago and i need to refresh it. I hated it, because of the Method. This way seems more enjoyable. but: How to download it? I got a podcast app as you suggested, than downloaded the rss, now what next? Danke schon. You are right, that’s one of the topics on my to-do-list… In the newer episodes I already do that. I’m starting with my German lessons here in Chile. My teacher (a German guy) told me about the slow german website. It’s very useful for me and my son Andreas. Maybe one little thing. It will be interesting to learn the nouns with their articles at the same time. 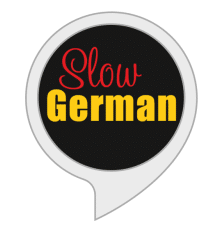 Slow listening is very good to speak correct pronounciation for the people who don’t have any source to listen the German. I have suggestion, if a pause/ stop can be incerted and also provide the rebinding the speech so that one can listen again and again the word for which one wish to improve the word specific pronouncation. It will be a great help for the beginer.